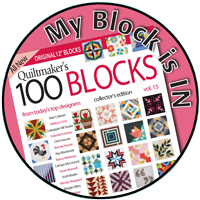 I joined an international quilt bee, Bee Inspired, with bloggers I met through the New Quilt Bloggers Blog Hop this past summer. 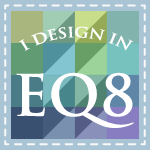 For January, Sharon from Yellow Cat Quilt Designs is the Queen Bee. 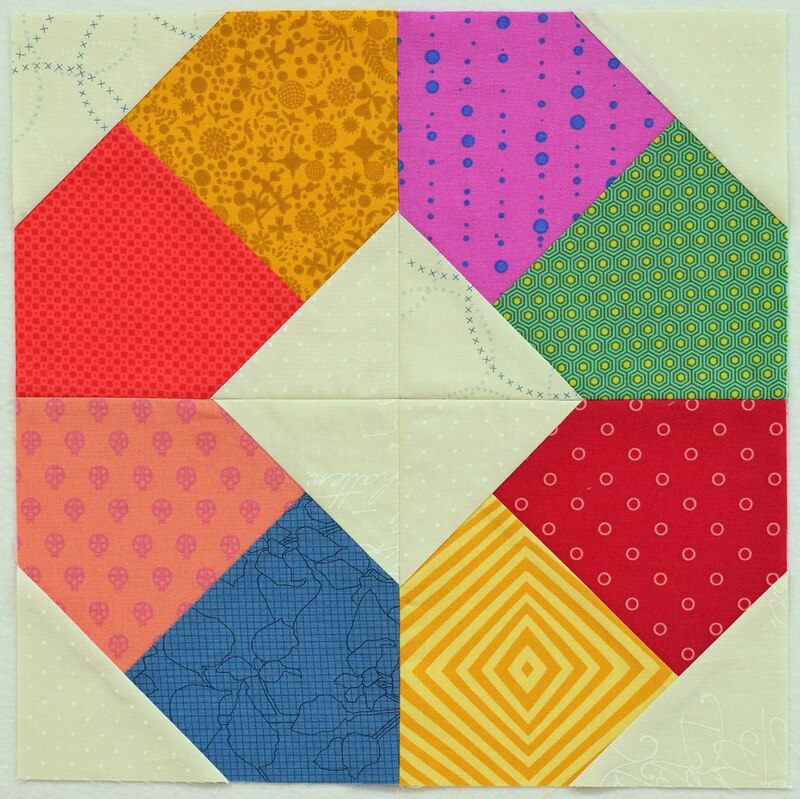 You can read about the colors and paper pieced block, Split Hatchet, she chose here. I can't remember the last time I did paper piecing, but I think it turned out OK considering. Not wanting to come up short on any of the fabric piece sizes, I roughly measured the fabric piece required and decided I needed a square at least 5 1/2" to 6" inches. I was a little too generous and cut them around 7", but better be safe than sorry. Sharon wanted bright colors with creme backgrounds. Here is the grouping of colored fabrics and I chose some charm squares of Modern Background Paper for the background fabrics. When paper piecing, I usually try to keep the grain relatively straight (especially on the outside edges) and cut the colored fabrics using the segment as a guide with a generous seam allowance added. Once I started paper piecing, it became easier as I went along. And once I trimmed the quadrants, removed the paper, sewed the sections together, the block actually measured 12 1/2". 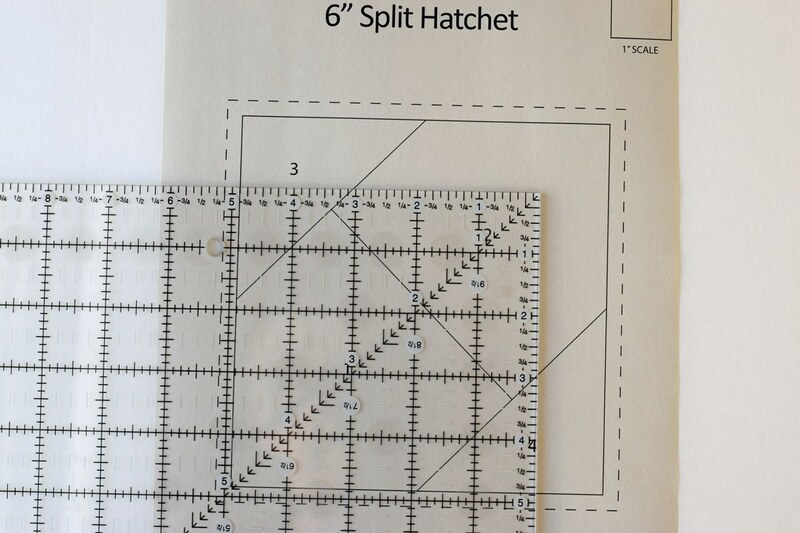 If you'd like to make your own Split Hatchet, you can find the pattern here on 627Handworks. We used the 6" Split Hatchet version to make Sharon's blocks. 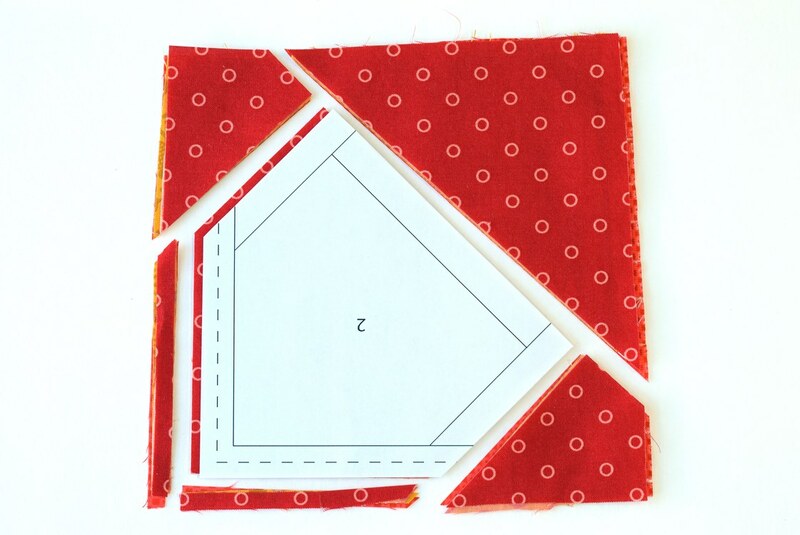 Since I included a couple of tips for cutting your fabric segments the correct size and on the grain, I'm linking to Tips and Tutorials with Yvonne at Quilting Jetgirl. 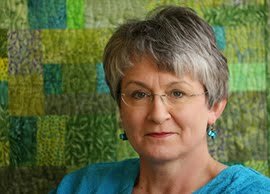 Also linking to Let's Bee Social with Lorna at Sew Fresh Quilts. Fun fabrics and block! I may need to try that block myself. I do love that block! And paper piecing is like riding a bike...right?! 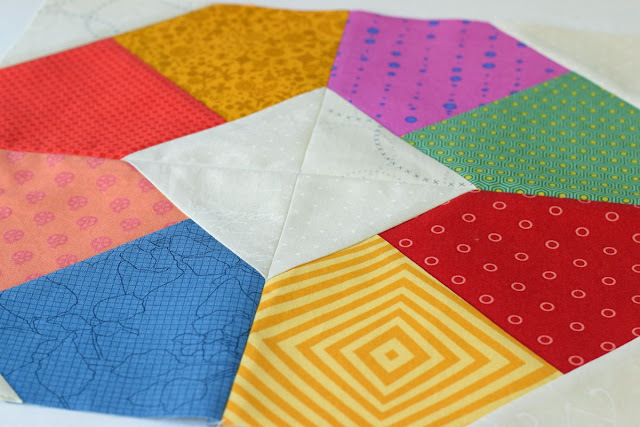 My favorite patterns are patterns where you are given measurements for each section of block. It really helps to speed up the process. I think you did a fantastic job on this block! This block turned out bright and fun. I'm sure Sharron will love it. You just have to love the accuracy and points that you get with paper piecing, so pretty. I like the colors you are using, how many blocks will you make? Your points look great! Very nice! 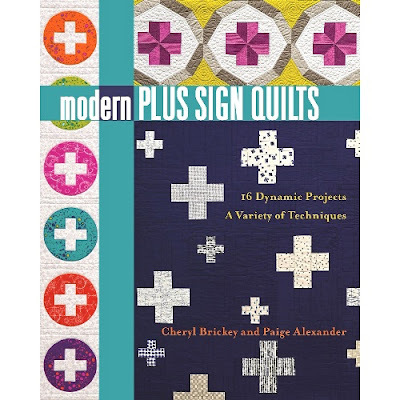 I've only done paper piecing once, and I was so new that it never occurred to me to think about fabric grain. That's a good tip; thanks! 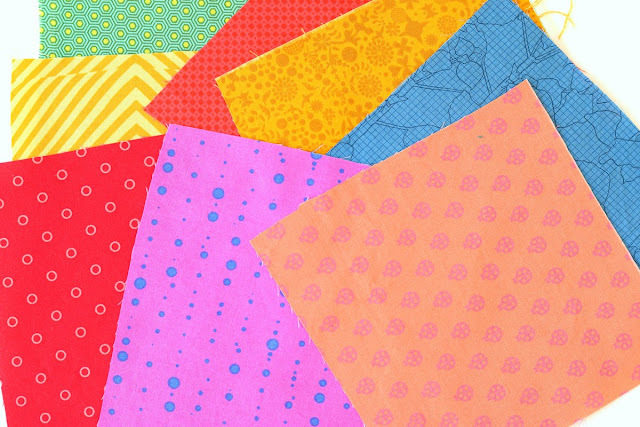 Such beautiful and fun fabric choices, Paige! Your block is a bright ray of sunshine for me this week. Thanks! I needed that! Great job Paige ! It's a beautiful block. I love this block! 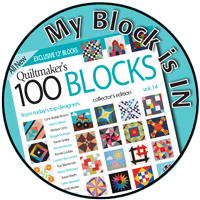 I'm participating in a bee this year with the McKinney Modern Quilt Guild (McKinney, TX) - would it be okay if I use this pattern for my month in the bee? Susan, by all means! 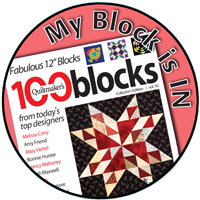 This is a great block for a group or bee! I think it's really doable even for someone without paper piecing experience. 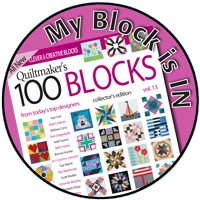 Gorgeous block - a really good one to use for Bees. I am sure the quilt will be fantastic. What a beautiful block, Paige! Thrilled with the fabrics you have used! I love it! And this was how I pieced mine as well...I like to cut my pieces like large templates and that does help with the grain. This bee is so much fun! Really nice job! I like it a lot! Nice, happy block Paige! 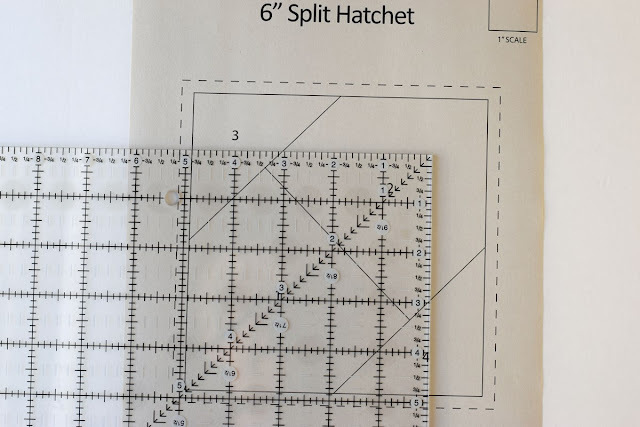 Great tips for paper-piecing too - I have the same problem Yvonne has and really have to focus and think about placement for the first pieces. After that, i'm usually ok.